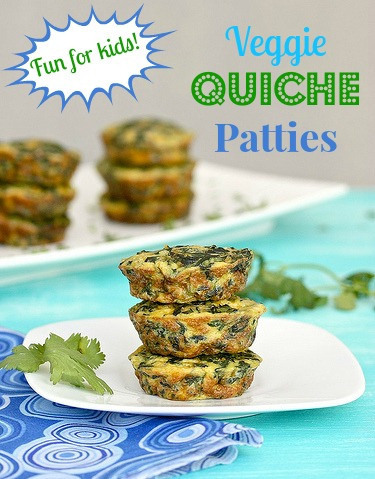 Teach your kids to cook by making these playful Veggie Quiche Patties together. 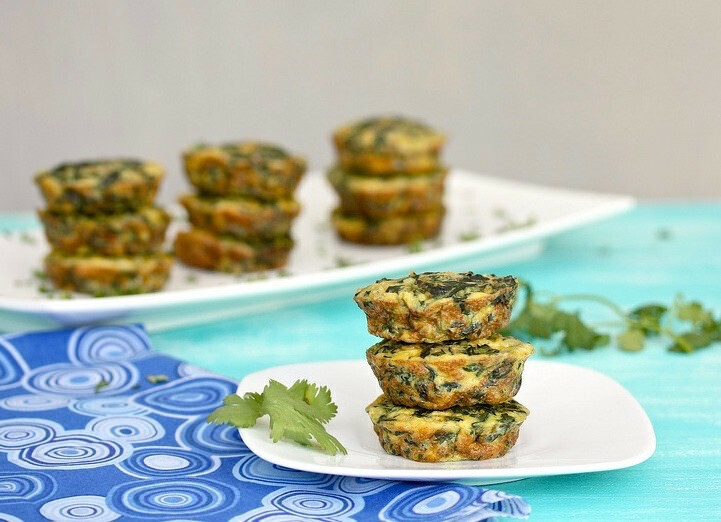 My healthy mini quiches are easy to assemble, fun for kids (and adults!) to eat, and they’re packed with immune-boosting vitamins A and C.
I was super excited recently when Michelle Obama announced her new Let’s Move initiative to encourage families to get back into the kitchen to cook together. At the Partnership for a Healthier America’s Building a Healthier Future Summit in Washington DC, she said that getting everyone cooking more “can fundamentally change the way families take control of their own health.” I couldn’t agree more, and in fact, I’ve been on the front lines of family cooking for well over a decade, breaking down the barriers to healthy home cooking with easy, affordable, and super flavorful recipes families love. I’m glad you stopped by today to check out this recipe and I hope you cook ’em up with your kids! For this month’s Recipe Redux healthy cooking food blogger challenge, I was assigned the task of creating a patty; something cute, fun to eat, and stack-able. 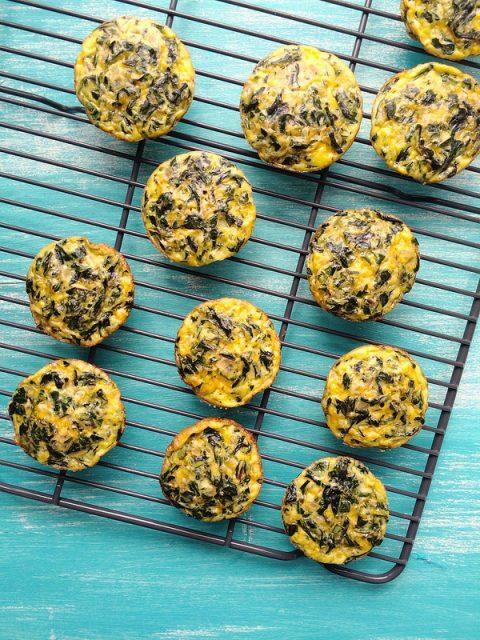 I kept my recipe simple—it calls for eggs, cheese, Swiss chard (or baby spinach), onion and garlic—and I cooked it in muffin tins. Kids and caregivers can easily make this recipe together. My Veggie Quiche Patties call for one bunch of Swiss chard, stemmed, trimmed, and chopped (or a 6-ounce bag of baby spinach). I’ve been finding gorgeous Swiss chard at the market lately, but you could certainly use a 6-ounce bag of baby spinach if you prefer. Some kids shy away from eating things that are green. If that describes your child, then change the name of the recipe to entice them to take a bite. Try names like Baby Omelets, Hockey Pucks You Can Eat, Mini Frisbees … whatever it takes! Or simply, cook with your kids using this simple recipe. I'd love to see the re-introduction of Home Economics classes in schools! Teaching kids how to cook is critical if we're going to stem the tide of obesity and poor nutrition. It makes sense, and it's a gift. When kids gain confidence in the kitchen, they grow up knowing how to prepare healthy meals for themselves and for their own kids one day. 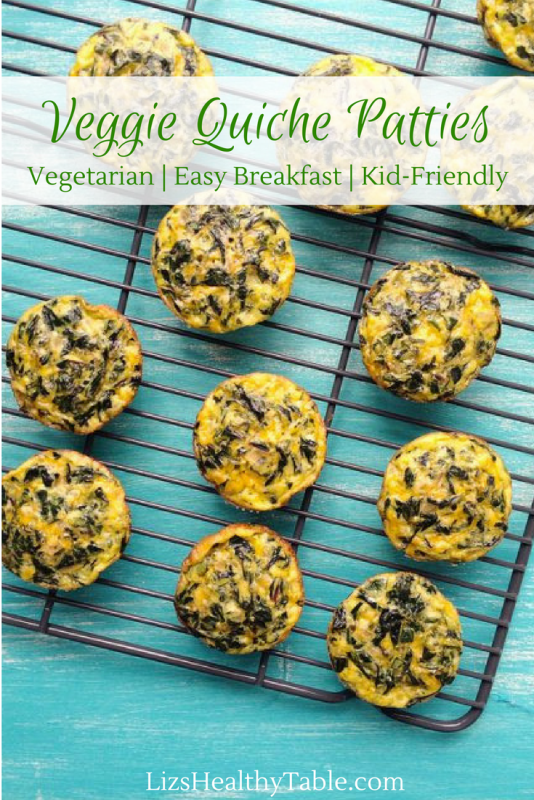 These adorable patties are easy enough for kids to make (with supervision, of course, depending on their ages), and they also accomplish the goal of getting everyone to eat more vegetables. Preheat the oven to 375°F. Lightly oil or coat 12 muffin cups with nonstick cooking spray and set aside. Place the eggs, cheese, and herbs in a large bowl and whisk together until well combined. Stir in the chopped vegetables. Using a tablespoon measure, pour the egg mixture evenly into each of the muffin cups. (You'll end up with about 3 tablespoons per muffin cup.) Smooth the tops. Each serving has 150% vitamin A, 60% vitamin C, 25% calcium, and 20% iron. These are adorable (if you can call food adorable) and YES YES YES to Home Ec (or I’m sure there’s a more up-to-date term) or Cooking classes becoming part of the regular school curriculum again. I love finding news ways to use interesting vegetables like Swiss chard! This look very portable. Perfect for a quick breakfast or snack. My kids and I make a version of these cute little yummies! Never thought of making with chard though…delish. And agree they’d be perfect for home ec! 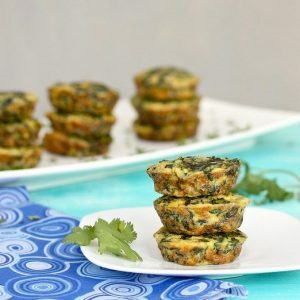 Greens cooked in eggs (frittatas) is one of the ways my kids will eat ’em 🙂 Love your twist on “patties” especially because there is no flipping involved. Genius! 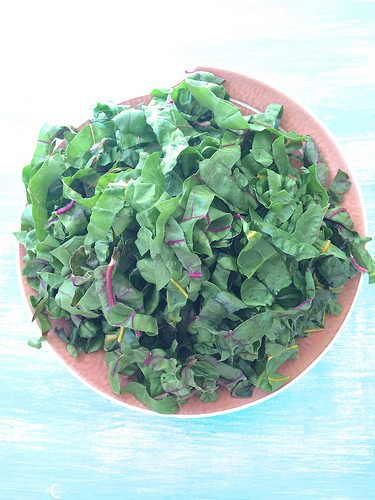 I am loving Swiss chard at the moment, or ‘silverbeet’ as we call it in Australia. Looks like a great combination for me to try out with eggs in little patties. Love the chard in your patties – can’t wait until our farmer’s market opens – that’s one of my favorites! Adorable little patties! And perfect for kids and adults. Love how you celebrate the Swiss chard with an image all its own. Gorgeous.